I came across this poem by Michelle W. Emerson and had to share. I couldn’t have said it better and this tells my story about my hero…my Father! The depth of a father’s love shows in his daughter’s eyes. What’s known is what’s shown from sunset to sunrise. A foundation built on more than just what is spoken. It’s commitments kept and promises that go unbroken. An emotion so immense that nothing in this world can erase. The permanent impression of love is tattooed upon her face. Yet so immaculate it’s obvious that, by God, it was planned. I believe it all began when she would sleep upon your chest. Now you’re her number one, her favorite, you’re the best! You move and she watches so closely it’s as if she’s in a trance. The fact that she can repeat you, exactly, isn’t just by chance. From wrestling, racing, jump roping to being made up like a doll. Both playmate and best friend, you’ve done some of it all. A secret place, a look, special time just for her and you. When a choice is to be made, it’s all about what Daddy wants to do. And you’re there to cater to her every need and every wish. There’s an invisible pedestal for Daddy’s little princess. Just to sit up under you, giving an occasional hug and kiss. Sweet dreams are non-existent without Daddy’s goodnight kiss. Your gentle stroke, words just for her, your check on hers is what she’d miss. It’s simply because of how you love her, I surmise. The depth of your love always shows in her eyes. With you, her laughter is harder and her smile is even brighter. You have a friendship, a bond, a soul tie that couldn’t be any tighter. It’s more than a special bond; it’s an exclusive connection. No room for a third party or attempted interjection. 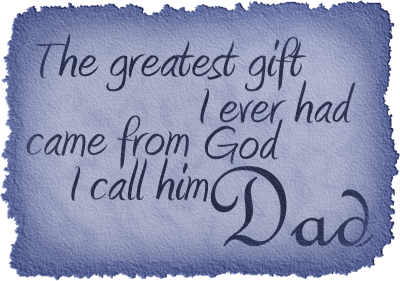 This love is reserved just for Dad and no other. It’s not the same for siblings, not even for Mother. It’s the kind of love that I could never despise. For the depth of your love always shows in her eyes. To her, you’d give anything, but it’s not about the gift. It’s that marvelous smile brought on by the spirit you lift. It’s not about what you can give her or about what you can do. It’s about the unconditional love reciprocated between you two. It’s the tears in her eyes when you two disagree. You’ll know she’s a Daddy’s girl when she passes by. She’s got the kind of love that never fades or dies. Whenever she’s with you, it’s Heaven in her eyes that shows. Her eyes hold a song so beautiful you’d think it was Heaven’s melody. It’s the music of love’s symphony composed by each precious memory. The love known is the love you’ve shown from sunset to sunrise. The depth of your love will forever show in your daughter’s eyes.